Clean, fresh mountain air, gorgeous surroundings and an endless variety of active, healthy activities for you to experience. With such beneficial attributes, it isn't surprising that Whistler has also become a renowned destination for health and wellness getaways. Explore pristine natural settings and soak up the resort's relaxed but adventurous atmosphere. Spend the day grinning your way through outdoor fun that will make you feel like a kid again, then be pampered like never before at an innovative and luxurious spa or wellness centre. 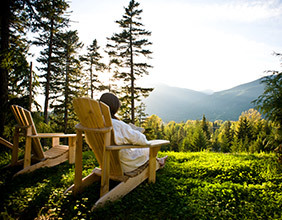 Discover why Whistler is the perfect place to relax, rejuvenate and cultivate a healthier lifestyle.